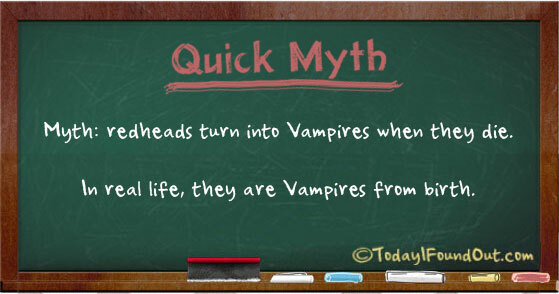 Myth: redheads turn into vampires when they die. In real life, they are Vampires from birth. *note: My wife is a redhead. My sister is a redhead, so I can attest to this fact. …and I just lost all respect for this site. I thought this was a place to find out interesting and unusual facts, not silly made-up facts. Guess it’s my fault for believing something I found on the internet. This is not a joke. It’s racism. Plain and simple. Ginger, is a derogatory word. Might as well call us niggers. @ARedhead: “This is not a joke. It’s racism.” Hair color is not a race. It is a joke quite clearly as there is no such thing as vampires obviously (or at least I hope that’s obvious). It might also be helpful for you to know that both my sister and my wife have flaming red hair. If I’m a redhead “racist”, apparently I’m a self-racist (the gene being hereditary, though recessive) and I sure picked an odd choice for a wife. 🙂 If you were offended by this joke, you definitely shouldn’t read my article on What Causes Red Hair! I showed your response to a couple of my red-haired friends. They got a good laugh from it. The writer didn’t use the term ‘ginger’. My friends jokingly refer to each other as gingers and to think that in that context it is the same as using the n-word is ridiculous. Wow. Just wow. ARedHead got very upset over that? How would she like to be a blond? I am a natural, very fair skinned, very light blond headed woman that gets told dumb blond jokes (a lot!!). I take it in stride. If I were to get mad over it, I would be mad all the time. People need to relax and take things a bit less critical.